Have you ever suddenly realized that it's fall? I mean, once September comes I know that it's fall. But, usually the weather is still a bit on the warmer side and we are all in a bit of transition. This weekend, I suddenly realized it was fall. I noticed while driving that there was a little less green in the trees, and a little more red and orange. So, with the cooler weather and red leaves, comes thoughts of fall decor. Today, I want to share with you a fall tablescape done three ways. It's easy to go to the store as each season or holiday comes up and stock up on plenty of pretty decorative items. But, to be honest, I don't have the storage space for all of it nor do I have the funds for all kinds of different holiday-themed decor. So, I thought it would be fitting to show you an elegant fall tablescape done three ways using what I had around the house. By keeping the linens and tableware the same, and simply swapping out the centrepieces, you can come up with a completely different look. I decided that using pinecones on the table would bring a bit of nature indoors. I scattered the pinecones across the tabletop, and put a few at each place setting. I also put two stainless steel/glass hurricane vases that are adorned with a branch motif. The pinecones I bought as part of a variety pack of fall decor. But, you could easily pick some up in your local forest or wooded area. This tablescape is simple and elegant. It's a timeless look that hints at a fall theme. Sometimes, there is no need to be so upfront with the time of the season. Sometimes, a little less is more. These hurricane vases are actually part of my everyday decor in my dining room. It's a great idea to look around your home and see what you can reuse in a new way. For the second look, I removed the hurricane vases and swapped them out with a simple outdoor lantern and pillar candle. I removed the black napkins for a cleaner look on the table. 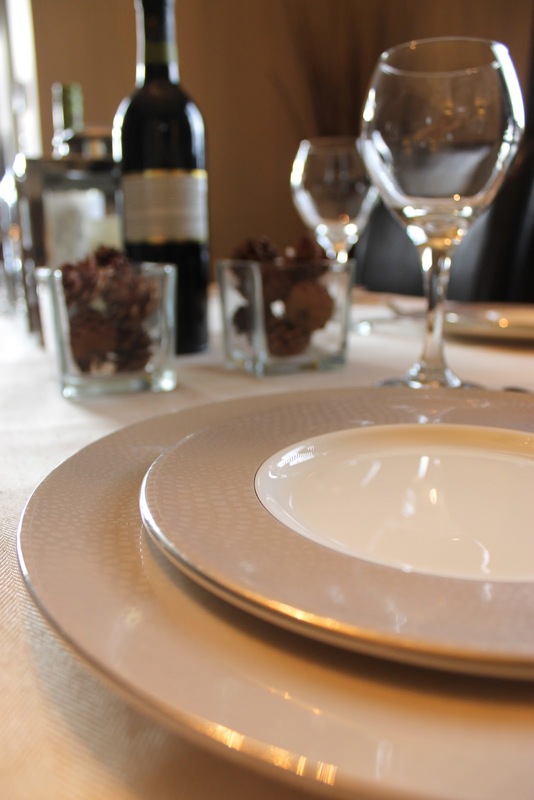 (I realize that napkins are a necessity for a dinner party, but I wanted to showcase the place settings here - you can easily bring your guests their napkins as you serve the dinner). The china is our wedding china - it's Monique Lhullier Femme Fatale for Royal Doulton. I opted to use the pinecones in a new way. Here, I put a few pinecones in four glass votives. These votives I bought from a dollarstore, and were previously in my home office on my bookshelf holding candles (another example of using what you have). This is another simple and chic fall tablescape. I have purposely chosen not to include a lot of different colours, but rather to keep everything neutral and elegant. For the third tablescape, I wanted to introduce some colour. I have still kept the same tablecloth, napkins, and place settings. But, this time I have introduced three different styles of liqueur glasses - to give some added colour and elegance. They also give a nice height to the table. I previously mentioned that I bought the pinecones in a variety pack of fall decor. I wanted to showcase the whole pack and did so by placing them in a rustic basket that I found in the basement (I think it came free as part of a bath giftbasket). The basket holds the pinecones, fake fruit, and one oversized pinecone. I also added some colour with a few votive candles (they are actually part of a christmas set that I got years ago - another example of using what you've got), and a pumpkin candle I got on clearance two years ago. The fake leaves were also part of the variety pack, but instead of placing them in the centre basket, I scattered them across the tabletop for an added punch of colour. I also wanted to show off the beautiful place settings as well, and decided to put the napkin between the salad plate and the dinner plate. This offers contrast between the plates and anchors the tabletop. So, there you have it - an elegant and simple fall tablescape done three ways with pretty much what I had laying around the house. Which of these three do you like the best? Do you reuse things around your house when it comes to seasonal decor? What are your secrets to budget-friendly holiday decorating?